A Long Island judge has been accused of breaking into an East Islip home to steal women's underpants. Greg Cergol reports. A Long Island judge has been accused of breaking into a home to steal women's underpants. Robert Cicale, a Republican district court judge from Suffolk County, was cuffed Thursday morning after a 23-year-old woman living on Donna Place in East Islip allegedly found him in her home, according to Suffolk County Acting Police Commissioner Stuart Cameron. Cicale allegedly darted out of the home when he was spotted. The woman, meanwhile, called her mother who then called 911. Officers found Cicale a few blocks away, according to Cameron. "He was found to be in possession with soiled female undergarments that we believe were either proceeds of this burglary or a prior burglary," he said. 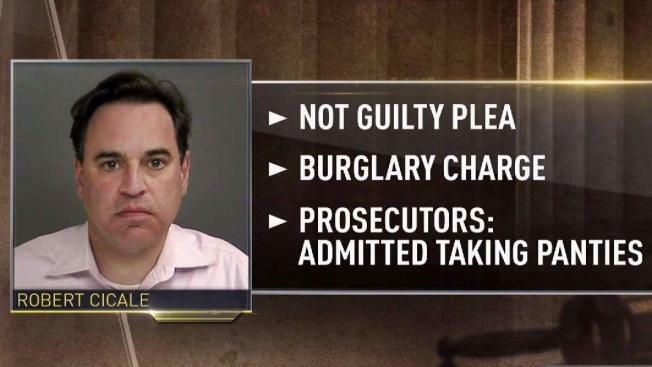 He was charged with second-degree burglary. He was scheduled to be arraigned in Central Islip on Friday. Cicale said nothing to reporters as he was led from a police precinct in the morning. Attorney information for him wasn't immediately available.